It’s just a birthday party… or did I lose the script somewhere? I hate birthdays. There you go. I said it. I have a six-year-old at home and I hate ‘em… these birthdays. I’m not trying to create momentum to some godforsaken thing. Nope. I’m just sick of all these fancy schmanzy birthday parties my girl has been attending. My well-meaning friends often tell me that I don’t follow the script of a ‘good mother’. 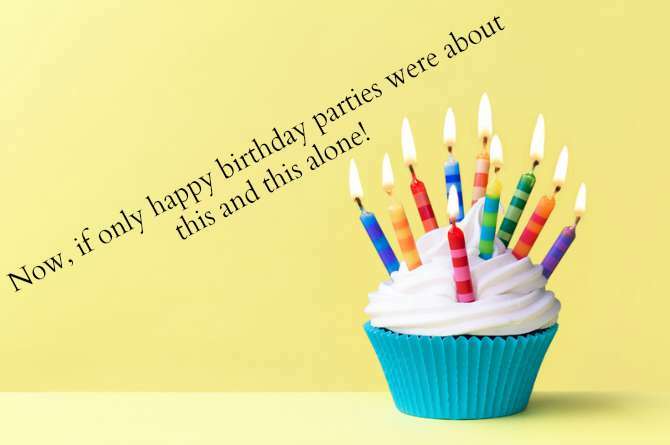 But seriously, why have parents these days made such a magnanimous deal of a good ol’ ‘happy budday party’? Whatever happened to the neighbourhood Bunty and 17 other Buntyss, Babloos and Pinkys ringing the door bell at 6:45 p.m. announcing, ‘Aunty aunty, it’s my happy budday at 7 p.m today. Please send Kamya on time’? I miss those days. I’m feeling terribly, horribly nostalgic thanks to the-one-I-gave-birth-to. It’s not her birthday this weekend. Or the next. In fact, it’s 67 days from now. Yes. In my nest, the countdown begins way too early. And she has already started planning for her birthday. Don’t miss the panic in my words, my dear readers. I’m not an evil mother. Except when I don’t read out the conventional endings to the conventional fairy tales. I do attend the PTMs, I do share my chocolates with her, I do let her watch Babe, even when my favourite movie, Kung Fu Panda, is running on another channel. I do all of that. 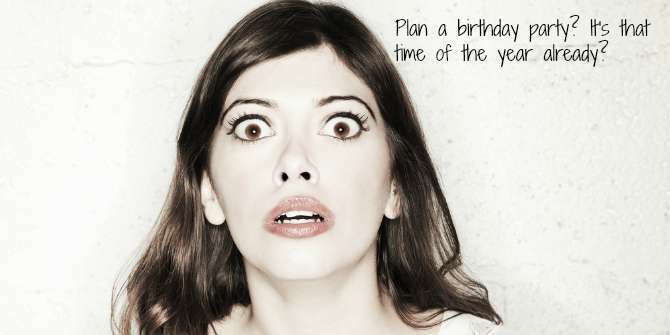 But coming up with thematic birthday parties, each year, every year, is a different ball game, don’t you agree? I got away with NO birthday parties till she turned 2. But by the time she was 3, she had a set of friends with insanely creative parents who’d organise grand affairs in the name of a birthday. Ranging from themes around astronauts to deep sea, there wasn’t much untampered with which fell in the space of the light blue sky and the deep blue sea. So when I told my child that we’ll get cakes and samosas and may be play passing-the-parcel, she rolled her saucer eyes and I yelped in my head. From an innocent birthday party to a furor-filled event, I have little memory of any of my birthday parties as a child and have only found a few pictures that prove that one ever took place. And I grew up as a happy child, into a happy adult. And I refuse to believe that time has changed so much that we need to create these make-believe worlds for that one, special day. Today ‘creative’ equates ‘expensive’. Why do I have to book a banquet hall or an event organiser to do up the place and in the process mortgage my kidney? Why raise the bar so high by recreating Disneyland at a 5-star hotel, when you can very well involve your child and his friends in doing up the décor of your own house and get it party-ready. Ready enough for a 5-year-old’s birthday party. If I had to spend so much, I may as well just go backpacking with her across the south of India. The fancy 7-layered cake. I’m already gagging. I remember my daughter insisting on a Winnie-the-Pooh cake for her 3rd birthday. In all my naivety, I got a custom-made Winnie posing with a pot of honey, with Tigger and Piglet made of sugar candy. It was all good till she cut the cake. And then, all I remember is being almost run over by an army of 3-4 footers, all for the Tigger and Piglet, overdosing on sugar. Being closest to the cake, Kamya managed to grab Piglet, although the cake was a mess with her left hand’s imprint on Winnie’s prosperous tummy. I’m still shaking my head. The invite list looks longer than Sikkim’s population. So I exaggerate alright. But then LOOK at the long winding list and it makes me wonder how social is my 6-year-old and WHO are these people? Have we been invited by them for their children’s birthdays? *cringe* What happens if we invite only close friends? Will the neighbour’s uncle’s neighbourhood child who didn’t get invited be mean to my daughter at the playground? Why ‘return gifts’? I don’t recall a single birthday party where I came home with a gift. So who exactly started this fad? And what if the return gift is not appreciated by the little human guests? What if they come up to me and say, ‘is this even a gift?’. Yes, I say this with much authority as it happened with me and I was so taken aback that I just apologised. Food lord! Whatever happened to a piece of cake, 2 éclair chocolates, a samosa and some potato wafers? Why do I have to have a chinese, continental, mughalai and dosa stall for a 6-year-old’s happy budday? Now do you think I’m hyperventilating? So I’m not a fan of planning children’s birthday parties. They stress me out more than a birthday party ever should. Even if it’s someone else’s birthday party. I am still not entirely sure why we can’t just have a few friends over to the house, play musical chair and passing-the-parcel, have some cake, drop some juice, plonk ourselves tired on the sofa and then get dragged back home by the gracious mothers. Do let us know your thoughts on this article on birthday party ideas for kids, in the Comment box below. Add these 5 cruelty-free cosmetic brands to your makeup bag today!